Sometimes deciding on a flavor is hard, but dessert should be easy! 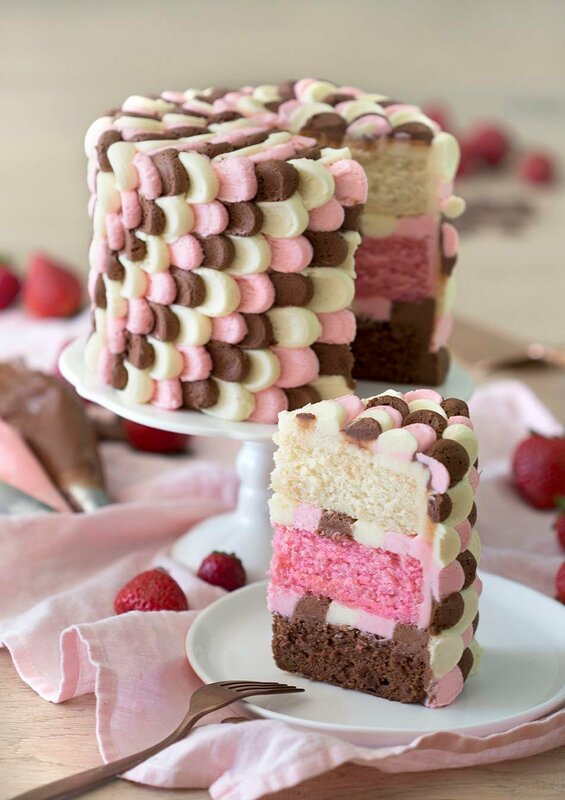 So have a slice of this neapolitan cake and led all the day’s stress float away. I made a neapolitan cake a few years ago and it was totally different, click here to check it out. This time around I wanted to go a bit more traditional, so I whipped up a good old American buttercream divided it in three batches and flavored them with vanilla, strawberry reduction, and chocolate. The cake layers are based on my favorite vanilla batter but are again divided and flavored with vanilla strawberry and chocolate. I used strawberry jam but you can make a fresh fruit reduction if you prefer. The layers all bake for different times. Chocolate was the fastest, followed by vanilla, with strawberry taking about ten minutes longer. Keep an eye out and make sure the centers are set before removing from the oven. Add hulled strawberries and lemon juice to a saucepan over medium heat. After the mixture heats up for a few minutes, mash the strawberries then allow to simmer for about 10 minutes. Strain mixture into a bowl. Cover and chill for another 10-15 minutes. Sift the dry ingredients together in a large bowl. Add the wet to the dry and mix until just combined. Divide the mixture into 3 bowls. Add the cocoa powder to one batch and mix. Add the 3/4 of the strawberry reduction to the second batch and mix. Transfer the three batters into three 6″ cake pans, which have been buttered and floured. Bake at 350 degrees F for about 30 minutes or until the centers are springy to the touch. Let the strawberry layer bake 5-8 minutes longer. Test with a toothpick. Whip the butter for about 5 minutes using a paddle attachment (stand-up mixer). Beat in the confectioner’s sugar slowly. Add the cream and vanilla. Beat until you have an even, fluffy consistency. Dive buttercream into 3 parts. Transfer one vanilla batch to a piping bag and snip off the tip. 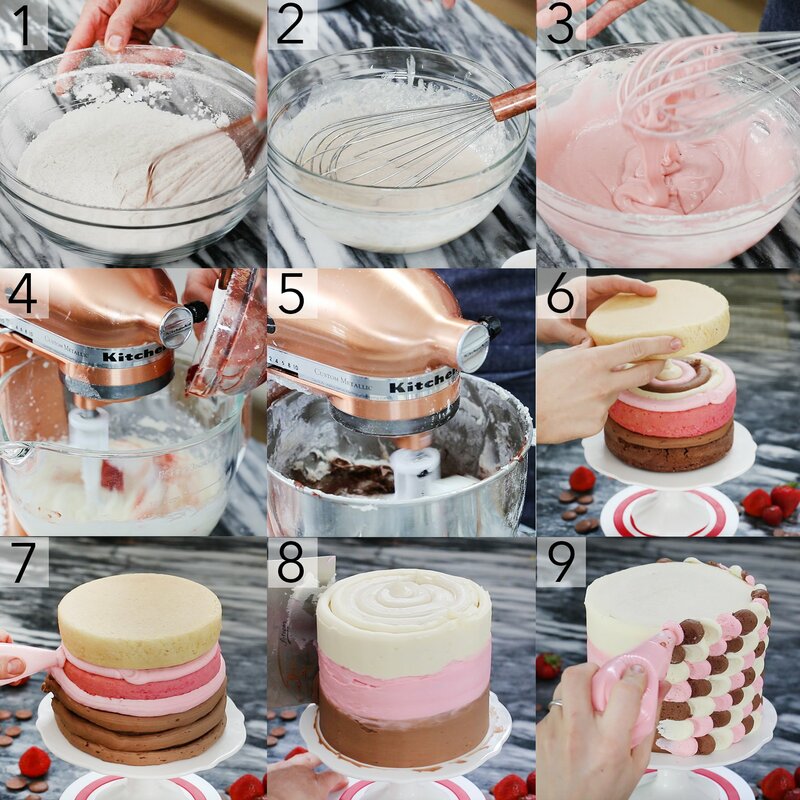 For the Strawberry Buttercream, Add the rest of the strawberry mixture to a buttercream batch. Add in a few drops of pink food coloring if you want the color to be more vibrant. Mix together until desired consistency. Transfer to a piping bag and snip off the tip. For the Chocolate Buttercream, Mix cocoa into one batch of buttercream. Transfer to a piping bag and snip off the tip. Pipe alternating circles between each layer with each buttercream bag. Add layers. Pipe and smooth out a crumb coat on the outside of the cake. Smooth with an uneven spatula and bench scraper. You cakes look amazing! I have a question about the flour you use. Why all purpose over cake flour? If you were to use cake flour or pastry flour do you think the same results would happen? I love your cake and thanks for posting the recipe!! I use all-purpose flour because I can never find cake flour at the store! You can totally use cake flour though! Hello. Wouldn’t using cake flour alter the structure of the cake since cake flour is lighter than AP flour? You can absolutely use cake flour for this recipe! Looks delicious and stunning! You mentioned a petal cake is easy so I am going to give it a try. Do you use a tip for the “petals”? Thank you. Use a large round tip to pipe the petals! Hope you enjoy! how much butter in grams, thank you. This cake was beautiful! I’m so happy I made it for my daughter’s 15th birthday! hello , my country doesn’t sell sour cream. can i omit it or replace it? Thanks so much! You can use yogurt instead! thank you for your reply.also a request.can you also listed the ingredients in metric [grams]? i know it will take time. but I’ve tried 4 different website which convert cups to grams and they’re all different.one said 1/2 cup of AP flour is 85 grams the other is 55 grams.so its kind of confusing. Yea I made this yesterday and that’s exactly why I did, I replaced the sour cream with yogurt and it came our perfect, soft and delicious. Thanks so much John. I am a big fan . Hi! I would love to try your recipe, but I would be making it for a larger group. Do you perhaps have the recipe for an 8 or 9-inch round cake? Hi. This recipe looks delicious and I would love to try it. Problem is, I would need at least an 8 or 9-inch round cake to feed the crowd that I’d be serving it to. Do you happen to have recipe adjustments for that size? Double the recipe for 8-inch pans or triple for 9-inch! Use any extra for cupcakes! I hope you love this cake! Okay, perfect. Thank you! And I’m assuming, double or triple the cook time? I used a large round tip, but you can snip off the tip of a piping bag too! Hi John, is it possible to use stabilised whipped cream with mascarpone cheese instead of using buttercream for this cake? I am slightly worried about the amount of sugar as it is going to be for my little boy’s birthday. I am thinking that I can reduce the amount of sugar if I use cream?